Nano Filtration – The newest and most leading edge technology in water treatment is now available for practical use in your home, business or manufacturing facility.Nano filtration is a pressure driven separation process. The filtration process takes place on a selective separation layer formed by an organic semipermeable membrane. The driving force of the separation process is the pressure difference between the feed (retentate) and the filtrate (permeate) side at the separation layer of the membrane. However, because of its selectivity, one or several components of a dissolved mixture are retained by the membrane despite the driving force, while water and substances with a molecular weight < 200 D are able to permeate the semipermeable separation layer. Because nano filtration membranes also have a selectivity for the charge of the dissolved components, monovalent ions will pass the membrane and divalent and multivalent ions will be rejected. All items except atmospheric storage tank mounted on an aluminum skid on wheels for ease of installation. Entire unit without atmospheric storage tank(s) measures 48″ wide x 25″ long 61″ high. NANO. unit with thin film element. Designed for 75% recovery and 66% rejection. Two 2.5″x 20″ long cartridge pre-filters. 5 micron and carbon block. Complete 12gpm @ 50psi re-pressure pump system. UV light on outlet as final protection. Unit completely tested and on a pallet suitable for LTL truck shipment. Our recommendation was Nano-filtration at the well that would treat the whole property. Irrigation valves and heads would be destroyed from the sand and high dissolved solids. The water heater and fixtures in the house would also be destroyed quickly. Using Nano-filtration versus reverse osmosis was the best option. Total dissolved solids can be lowered to an acceptable level rather than removing 90-95%. Less cost and less energy used as well. The main reason for using this system is to reduce Total Dissolved Solids. Most well water applicationstypically need some type of treatment. Iron, hardness, nitrates, etc. Water with high dissolved solids causes many problems and needs to be treated. 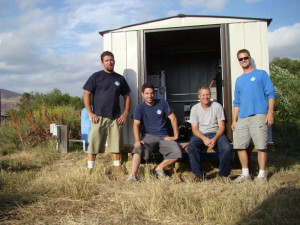 If you live in Southern California, feel free to call for a free water analysis and estimate.